"The Angels Take Manhattan" is the culmination of Moffat's delve into the Doctor's decidedly destructive tendencies. 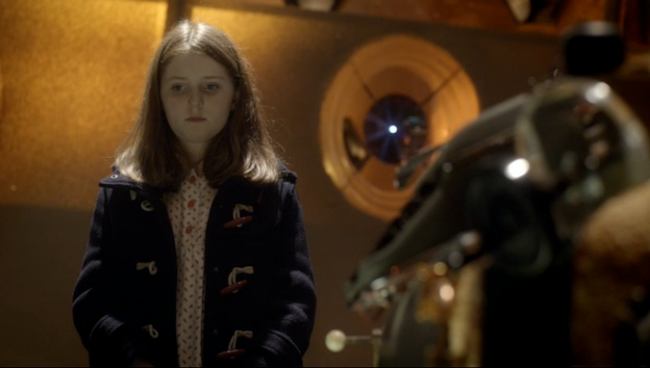 Caitlin Blackwood as the young Amelia Pond in "Let's Kill Hitler." There's a definite philosophical dividing line between the Russell T. Davies/Christopher Eccleston/David Tennant era of Doctor Who and the Steven Moffat/Matt Smith seasons. That difference began, sneakily, to manifest itself in the very first Moffat/Smith episode, "The Eleventh Hour," but it didn't really come to the fore until the sixth and (currently airing, pretty fantastic) seventh seasons. This underlying change in philosophies mostly concerns the way the show treats its central character, 1200-year-old time-traveling adventurer The Doctor, and the effect that he has on the people who travel with him, fight with him, and love him. Davies' Doctor, as embodied by Eccleston and Tennant, is (almost) never anything less than a full-on hero. There are moments when the show acknowledges his destructive impact, sure - Donna has to save the Tenth Doctor from his own rage when he drowns the Racnoss queen, and he power-trips when trying to change a fixed moment in time in "The Waters of Mars" - but, all in all, the Davies-era series shied away from taking a hard look at the tensions between the good intentions of its hero and the broken people left in his wake. The thing is, the tensions were there whether or not Davies and his writers (who, in all fairness, included Steven Moffat) wanted to deal with them. All you have to do to appreciate the destructive tendencies of the Time Lord is look at his companions. Rose, trapped on a parallel world with a cloned copy of the man who couldn't bring himself to tell her he loved her. Jack Harkness, stranded in the 51st century on a destroyed satellite. Donna Noble, the Doctor's best friend, who can't ever remember the wonderful things she saw on the TARDIS. River Song, in prison for the murder of the man she loves. And of course, Amelia Pond, the girl who waited. The only one who made it out, whole and (mostly) unscathed, was Martha, who was also the only one who chose to leave. The difference between the cases of Amy and River and those of Rose, Donna and Jack, is Moffat and Smith's willingness to acknowledge the damage that the Doctor inflicts on those who travel with him. Davies occasionally skirted around the issue, but he almost always shied away as soon as the Doctor's heroism was called into question. Take, for example, Davos' accusation in "Journey's End" that the Doctor, the man who never fights, turns people into soldiers willing to die for him. It's a compelling moment that Davies immediately discards in favor of a heart-warming ending where the current and former companions come together as a family and destroy the Daleks. Moffat, however, doesn't flinch in the face of the Doctor's contradictions. (In fact, he does the opposite, and in "A Town Called Mercy" has a character articulate the disconnect between the man who committed genocide to end a war and the doctor determined to save everyone, in a bit of over-obvious explanatory dialogue that would make the Fringe writers' room blush.) Never has this been more apparent been than in Saturday's wrenching mid-season finale, "The Angels Take Manhattan." The episode - which brought back the terrifying Weeping Angels, who somehow manage to remain just as frightening as they did back in "Blink" - was partially about an attempt by the Doctor, River Song and the Ponds to eliminate an Angel infestation in New York. Really, though, it served as a dissection of the Doctor's complicated relationship with his companions, and the way he can completely shatter their lives while enriching them indescribably. The Doctor always acts as a protector - of people, of planets, of galaxies and universes - but, as River tells Amy, he has to be protected too, from the thought of those he loves growing old and dying. The ironies of Amy Pond, the girl who waited twelve years for her Raggedy Doctor to fulfill his promise, having to protect him from the passage of time are downright tragic. "The Angels Take Manhattan" was a singularly stellar episode that managed to combine Doctor Who's usual dose of sentiment with deep, aching sadness and a clear-eyed view of its protagonist. The moment that best encapsulates the Moffat's approach to his increasingly un-heroic Doctor, however, came much earlier, in the sixth season's River-centric outing, "Let's Kill Hitler." The previous hour, "A Good Man Goes to War," had taken on the problem of the Doctor with the character of Lorna Bucket, a girl who, like Amy, waited for the Doctor to return to her. Unlike Amy, however, she never had her wish fulfilled. With the image of Lorna, dying to save the man who had forgotten about her, fresh in viewers' minds, Moffat and Smith gave us a punishingly dark scene in which the dying Time Lord faces all his future companions (albeit as hologrammatic projections of the Tardis' voice interface). They're all there: Rose Tyler, Martha Jones, Donna Noble. The woman who broke down the barrier between universes for a man who left her trapped in a parallel world. The shell-shocked survivor of the end of the world, who only escaped with her sanity and her life because she chose to leave. The Doctor's best friend, who will never remember that she saved the universe. Faced with the ghosts of a past he can't escape, no matter how far he runs, the man who has saved humanity more times than anyone can count articulates the sentiment that, more than any other, has driven the last two and a half seasons of the show: "There must be someone left in the universe I haven't screwed up yet." In response, the interface takes the form of Amelia Pond. The girl who waited in her garden for a man who wouldn't come back for twelve years. The girl who would travel with the Doctor only to end up as another casualty, torn from her own life and sent back into the unreachable past. Just one more person whose tragedy would break the Doctor's hearts.